Kansas City is home to some serious sports fans! 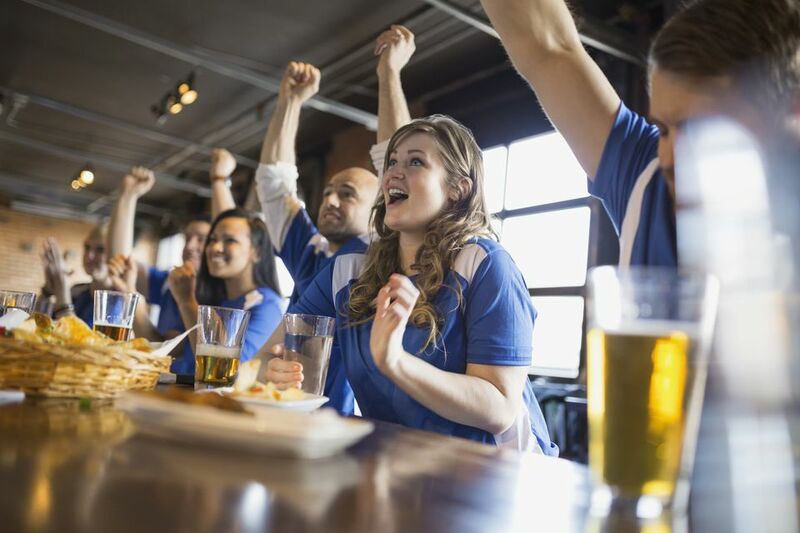 From cheering on the Kansas City Chiefs NFL team and baseball's Kansas City Royals to rooting for border rivals​ the University of Kansas and the University of Missouri, fans love to show their loyalties. To do so, Kansas City has some of the greatest sports bars in the Midwest. You can grab a beer with hearty food and just chill with the gang or watch your team on a huge HD screen. Here, for our money, are the top 10 Kansas City sports bars with something for everyone. Take your pick and enjoy. Check the website of each establishment for the most up-to-date hours. Dave & Buster's, located at the Legends Outlets Kansas City, does it up right in this sports playground with everything from Skee-Ball and Pop-A-Shot to interactive NASCAR. The family-friendly place has a huge bar and TVs galore, plus great burgers and steaks, and huge salads. More than just a sports bar, Chappell's is a bona fide museum enshrined in a restaurant, and it fulfills all three functions exceptionally well. In 2005, "Sports Illustrated" named it one of the 25 best sports bars in America. And "USA Today" has called it one of the top 10 restaurants and sports museums in the country. Northwest Missouri State even conducts a sports memorabilia class at Chappell’s, home to the largest personal collection of sports artifacts in any bar in the country. To anyone who knows Chappell's, this Northland gem is a sports wonderland with wall-to-wall sports memorabilia that owner Jim Chappell has collected over the years. Jerseys, autographed balls, helmets: Chappell's has more than 10,000 items, including an autographed pair of Muhammad Ali’s gloves and the Oakland A’s 1974 World Series trophy. While you're there, grab a cold one, have some of the great food that keeps customers coming back and catch a game. Considered by many to be KC's upscale sports bar, Nick and Jake's three locations in the Kansas City area are also chef-driven restaurants with American cuisine that goes from burgers to filet mignon and a full Sunday brunch buffet of prime rib to omelets that's been voted the best in Kansas City. If it's drinking you're after, have a seat at the beautiful oak bar, where you can order from the beer and wine lists, or ask for one of the bartender's specialty cocktails. Once you've eaten, you can get comfortable and watch your favorite team from any vantage point on the many TVs. With more than eight metro locations, Tanner's Bar & Grill gets high marks as a local favorite. Tanner's is what you'd expect a sports bar to be—great bar food, cold beer and plenty of TVs for spectator sports. They've got delicious sliders, wings and something called "chicken lips." Any place where you can add Rotel to your tater tots is tops with us. The Granfalloon is one of the best sports bars in the city with an assortment of 22 HD TVs tuned to ESPN, cold beverages and a resident group of sporty guys. Order food, gather some pals and watch the game. But if you've got your heart set on ordering a Bully Pale Ale don't do it here—they don't serve Boulevard brew. Named after a Kurt Vonnegut Jr. quote—"A Granfaloon is a proud and meaningless association of human beings! "—this bi-level bar and restaurant ​has plenty of meaning for the many regulars who love the upscale pub fare and casual dining (from a kitchen open until 2 a.m.) that encompasses fish tacos with mango slaw to Chicken Parmesan pizza with roasted chicken, bacon, tomato basil relish and spinach in a Parmesan sauce. At night the place is busy and rambunctious, and you might see a national celebrity and sports figure or two. Well known for great pizza at nearly 20 locations in the greater Kansas City region, Minsky's has been making award-winning gourmet pizzas for four decades that have been repeatedly voted Kansas City’s best pizza. Minsky's locations vary considerably according to the number of televisions available for your sports watching pleasure, but the Barry Road West, River ​Market, and Lenexa locations have plenty of boxes to catch your favorite game. Some sites are official Nebraska football watch sites. The pizza is made with hand-rolled original or honey whole wheat dough in thin and crispy, bi-level style or deep dish pan. You can team a pie with drinks from a full bar. Yes, yes, yes...we know, but they've got great hot wings and fries. Orange short shorts aside, Hooters is, after all, a sports​ bar with good food off the grill. It's a great place to catch a game and enjoy some tasty bar food and a cold brew in a frosty mug. With five metro locations, there is a Hooters in every major neighborhood. Plus, they're a caring gang that gives vets free meals on Veterans Day. When heading to one of the O'Quigley's KC sports bars, choose the Northland, Leawood, or Lee's Summit locations which promise a great assortment of hearty Irish-style fare for your enjoyment—all while watching the game on one of their humongous screens. The full menu is a real draw and has everything from soup to desserts like homemade Irish pound cake and funnel cakes. What tickles us is the selection of big, filling "Sammiches." Imagine The Boar made with house-braised and -smoked pulled pork on a brioche bun with gruyère cheese and onion rings or the O'Baby LT heaped with eight slices of bacon, tomato, lettuce and Monterey Jack cheese. As if the name didn't say it all, Coach's Bar & Grill has two great neighborhood locations for all things sports. Long considered the foremost sports bar in Kansas City, it was also one of the first when it opened in 1983. Owners Chris Carle and Mike Darby don't disappoint with their masses of HD projection TVs and a 50-inch plasma TV to satisfy the biggest sports enthusiasts. Usually packed for big college and pro games, the gang at Coach's is always happy to turn on whatever game you want to see. Aside from the sports action, a few other things keep patrons coming back, like the homey fireplace room, sports memorabilia lining the walls and the great menu with freshly made comfort food like Yankee pot roast and chicken fried steak.